Quicksilver, LaunchBar, Alfred, and LaunchMagic: if you’re a Mac power user, chances are you’ve tried at least one of these app launchers in the past. If you have, then you’ll be right at home with LaunchMagic 4 (Mac App Store link), Chronos Software’s latest release in its productivity software suite. 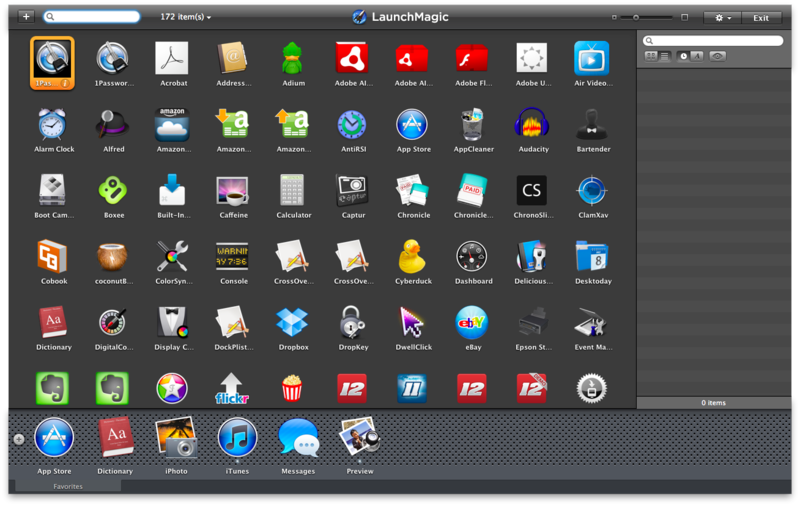 In truth, LaunchMagic is more of a hybrid app launcher and organizer than merely a standalone launching app. The app has a visual style unlike others in its class, which helps it stand out in the crowded app launcher field. Like most app launchers, LaunchMagic resides in your Mac’s menu bar until needed. The default hotkey is Command-Enter, but of course you can change this in the app’s preferences. 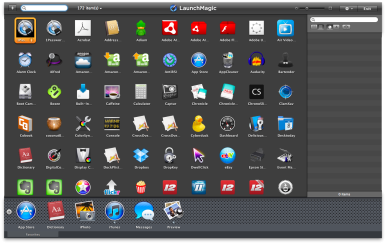 When you invoke the hotkey combination, Launch Magic reveals its “Launch Center,” an app icon overlay that fills the screen. This area has three sections: a search bar at the top, a grid of app icons in the middle, and a “file launcher” option to the right. You launch apps by either clicking on their icons or searching for them in the search box. LaunchMagic also includes two other key elements: a dock and a “blaster.” The dock provides quick access to your most frequently used files. Essentially, you can launch apps from the dock rather than scrolling and clicking on the icon or searching for an app in the LaunchMagic main window. The LaunchMagic “blaster” is a variation of OS X’s default command-tab app switcher. The difference is that LaunchMagic can open apps whereas the OS X command is used to switch between apps that are already open. As with most applications, the key to integrating LaunchMagic into your workflow is learning how to mold the app to your needs. Given the customization and visual polish present, LaunchMagic is a worthy addition to any Mac menu bar.